By admin , in Arthritis on February 1, 2019 . 1.2 What causes gouty arthritis? 1.2.1 What are the risk factors for gouty arthritis? 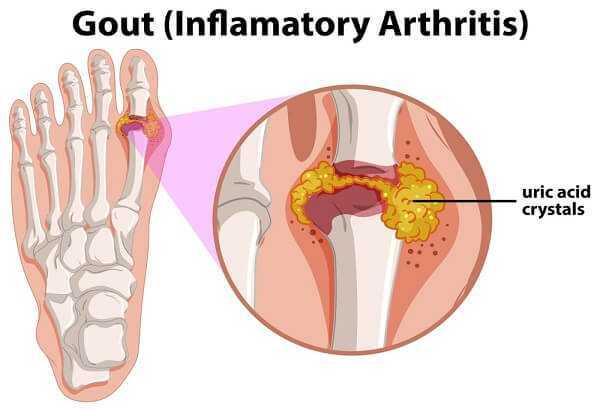 1.3 What are the signs and symptoms of gouty arthritis? 1.4 How is gouty arthritis diagnosed? 1.5 What is the treatment for gouty arthritis? 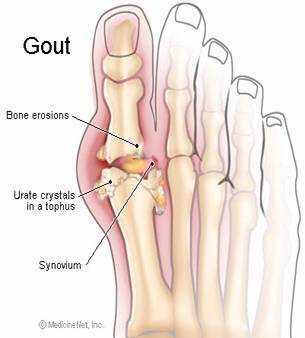 Gouty arthritis is a type of arthritis which is developed by the accumulation of uric acid crystals in joints. It is very harmful disease and in most cases, it affects only one joint, especially the big toe. It can also affect the ankles, wrists, elbows, foot, knees and fingers. It is mainly affected men than women and rarely found in young adults and children. A defect in metabolism is the main cause of this disease, which results in an overproduction of uric acid. Sometimes, it reduces the ability of the kidney to eliminate uric acid. Risk is increased by excessive alcohol use, obesity, kidney disease, diabetes and sickle cell anemia. In some cases, it can be associated by genetic. What are the risk factors for gouty arthritis? Age: It is first occurs in middle-age people. It is commonly developed in age group with high blood pressure, heavy alcohol use, obesity, and unhealthy cholesterol levels. Heavy alcohol use: In younger adults, it is associated by heavy alcohol use. Genetics: 25% of people with gouty arthritis have a family history of this disease. Gender: Men are mainly affected by this disease. Men are more likely to associate the disease between the ages of 30 and 50. Medications: It can associate by use of diuretics to treat hypertension. Uric acid levels in the blood can develop by low-dose niacin, aspirin, tuberculosis medications such as ethambutol and pyrazinamide, cyclosporine and others medications and lead to gouty arthritis. What are the signs and symptoms of gouty arthritis? The big toe is the most common of gouty arthritis. Other joints such as wrists, elbows, ankles, fingers and knees can be affected by this disease. This is characterized by a rapid onset of pain in the affected joint followed by swelling, marked tenderness, warmth and reddish discoloration. Sometimes, patient can develop fever with gouty arthritis. These painful attacks subside in few hours to few days, with or without any medicines. People with gouty arthritis will be experience repeated attacks of this disease over the years, in most cases. How is gouty arthritis diagnosed? A test will be performed by the health care providers to measure the level of uric acid in the blood. Other blood tests performed are electrolytes, erythrocyte sedimentation rate, blood count and renal function. The light microscopy of joint fluid may be performed by the doctor to diagnose gouty arthritis. X-rays is also used to determine the disease. What is the treatment for gouty arthritis? The goals of treatment for gouty arthritis consist of avoiding severe attacks in the future, alleviating pain or preventing joint damage. Pain medications are prescribed by the health care providers to increase the quantity of fluids and encouraged to rest. Nonsteroidal anti-inflammatory drugs such as indomethacin, naproxen sodium or ibuprofen will be preferred by the doctor to treat the disease. Patient should avoid closely related drugs like salicylates and aspirin because they can ultimately worsen the disease. Surgery is used in some cases to treat gouty arthritis. This treatment is very effective and expensive. However, it is used to remove large tophi that are interfering with the movement of joints, draining and infected. In some cases, it is necessary to replace joints.